We released an update of its Web Call Server 5 media server to work with Safari 11 in iOS and MacOS. The update allows developers to create streaming broadcasting apps, video chats, video calls and other web applications that work directly in Safari 11 browsers from Apple on iPhone and iPad. At the end of September 2017, Apple released an important update of the iOS 11 operating system for iPhone and iPad. This update presented a new Safari 11 browser with support for the WebRTC technology that allows audio and video communications in real time. Prior to this update the Safari browser did not have access to the camera and microphone, and could not broadcast live video streams. With the release of iOS 11 the situation changed drastically, and millions of iPhone and iPad devices based on iOS out of the blue and without installing third-party software received a browser that can run video chats, broadcasts and internet calls thanks to WebRTC support. Flashphoner develops its own WebRTC media server Web Call Server 5, a software platform for browser-based broadcasts from web cameras and for online video calls. 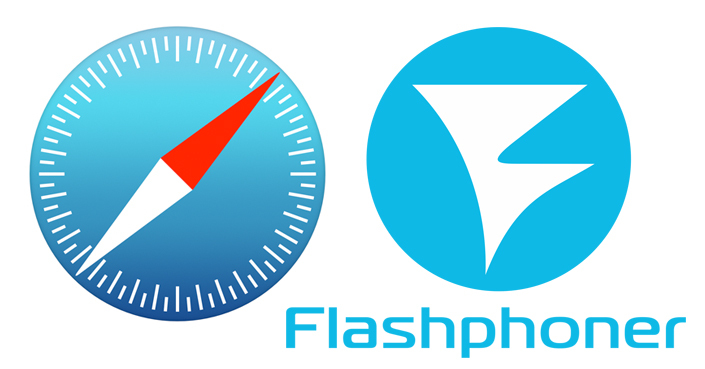 In time with the release of iOS 11, developers at Flashphoner added compatibility with the new Safari 11 browser and released an update that now covers Chrome, Firefox, Edge, Safari, iOS Safari browsers. As a result, with WCS5 application developers can run cross-browser video broadcasting as well as online calls. This includes iOS Safari that previously was unable to do this due to technical limitations of the browser. The lack of support for WebRTC in iOS Safari 9 and 10 was a serious limitation that prevented developers from running low-latency video chats and broadcasts in browsers of Apple mobile devices. As soon as the support for WebRTC was added, the Safari browser instantly learned to broadcast and play video with low latency, less than one second. The WCS5 media server allows such broadcasts not only between Chrome, Firefox, Edge, IE, Safari browsers, but also surveillance IP-cameras and SIP devices. “Now, the simple question, if camera and microphone broadcasting will work in Safari, receives the simple answer – yes”.